The Jabberwookie is so named because it vaguely resembles both a jabberwocky and a wookie, if you were to put both in a blender and grind their respective parts vigorously. Both have furry claws, and both are large and unsociable. The Jabberwookie has the muscular limbs of the wookie and the mouthparts of the jabberwocky. 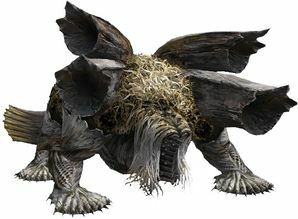 Its bat-like wings are entirely non-functional, but aid it in making unexpectedly sudden and long leaps onto its face. The Jabberwookie is much-feared in its native habitat for its sandwich-making skills. If you should spot one, do not ask for mustard on your BLT, as you will most likely die from overstimulation of the taste buds. It is advised when sparring with a Jabberwookie to offer to make it lunch, as the creatures tire of constantly making sandwiches for other monsters. This page was last edited on 20 February 2019, at 13:28.